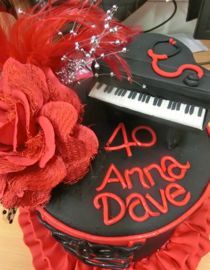 Just to prove it's not all jelly brains and eyeballs around here, here is a cake for a Burlesque/Can-Can themed 40th birthday for 2 doctors, one of whom plays the piano.. I'm just looking through some photos of Zali's Creepy Party from 2011 for something to illustrate Jett's party invitations with (he wants a 'Gross' party - somehow it is different?). 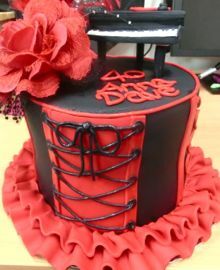 I think I found the perfect thing - I know I would have posted this at the time but I think it deserves a re-post - as this cake was a masterpiece if I do say so myself. I seem to remember the kids bunching up at the party food table as far away from the cake as they could possibly get.. job done me. 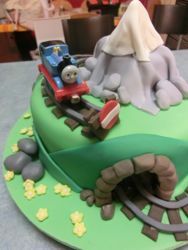 Jamie's Cake from wo to go..
1) First.. the cake - one I happened to have in the freezer, and the train, supplied by Denny.. 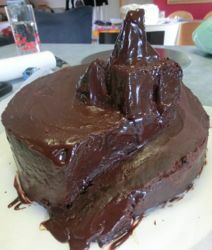 It practically looks done already doesn't it - actually this is usually about where I stop with my own kids as I think it's important to keep the bar nice and low..
2) Shaping the cake. 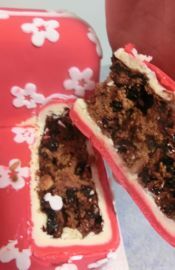 I had a vague idea in my head of how it should look.. which is lucky, cos no-one else would have worked it out at this point..
3) Covering with ganache, which I happened to have in the fridge. 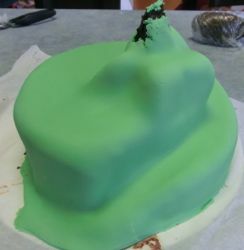 Still a cake only its mother could love..
4) Using regular green colouring I coloured some green icing (now I have green hands) and then covered the cake..and put it on a green cake board, as covered boards are a simple way of making a cake look fancy schmancy.. note I wasn't worried about the tear in the top - you'll see why next..
5) Fondant icing lends itself to good rocks, and really good mountains, so why fight it..
6) I added some dark green hills as well for some depth and to hide the messy edges where the side of the cake meets the board..
7) On with the track.. this involved rolling out some brown and pre-cutting all the sleepers and letting them dry while we had dinner so they would be stiff and hold their shape when I put them on.. I built a bit of a rustic railway bridge going up the hill with the spare sleepers as I'm always concerned about passenger safety. 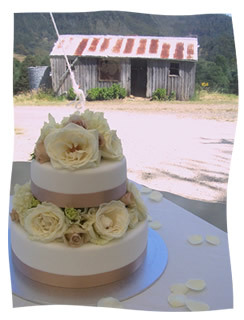 8) Then it was time for the finishing touches - these weren't pre-planned but it was clear the cake needed a little bit of non-green-or-brown colour, so I added the flowers (and more rocks) to the fields at the bottom, and the red end-of-line sign at the top..
And Voila. Done. How long did it take? Well I started step 1 at about 2.30pm and finished at 9.30pm but in-between I picked up the kids, made, ate and cleared up dinner, and pottered around doing some other little things as well. During the making I also watched a couple of episodes of 'Laid' and 'Mad as Hell' on iview which probably slowed me down a bit too. 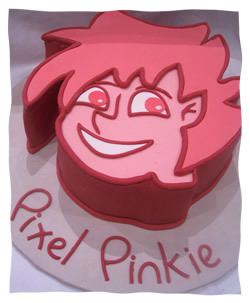 Luckily I had leftover brown & yellow fondant already which saved some time as that can take ages to colour. 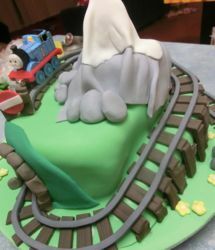 So there you go, from a brown blob to precarious mountain train journey all in one afternoon.. Sometimes you need an explanation.. I haven't made many cakes lately, with all our weekend activities it's difficult to focus on cake deliveries and it also means I have to be around to actually make them during the week - so it just feels too restrictive at the moment. Having said that, there are circumstances where I will agree to make one. This one is for a customer of an ex-student who did an order of mine when I realised I wanted to go away - this is basically the reverse situation (she took the order then realised she was going to be away) so I was happy to agree to it. 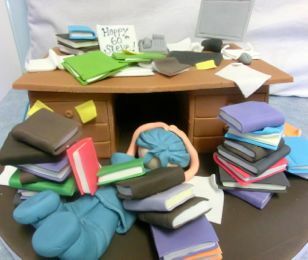 So the customer sent me some photos of the home-office belonging to a surgeon and asked me to do something based on that.. 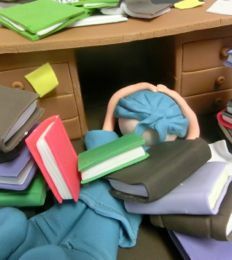 The photos showed a very very messy office with piles and piles of books stacked on the floor, on the shelves, anywhere really.. and also files (presumably medical) piled onto the desk.. 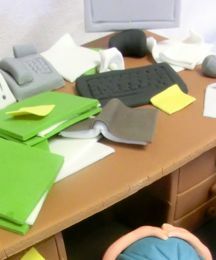 So this is what I did.. it's a book-a-lanche.. everything is edible, the desk is the cake, the rest is fondant..
Or the time when a chance phone call reminded me that I had a cake to deliver the very next day (which I hadn't started). I was at work at the time so I suddenly made my excuses and rushed home for a very late night. Again - it all ended well but it was very close to being a disaster! 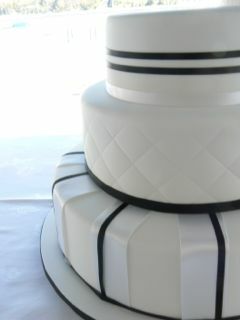 Or the time(s) I delivered a cake to a venue, and got to the cake table only to see a cake already on the cake table. Luckily a day early is a lot better than a day late! 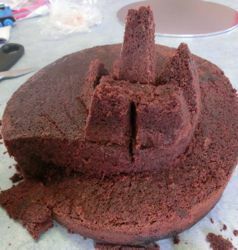 There have been a lot of kitchen mistakes too which get fixed before they go into the car - just last week I managed to burn a fruitcake, make and ice a cake in totally the wrong flavour and then make and ice a cake in totally the wrong size - all for the one wedding cake! 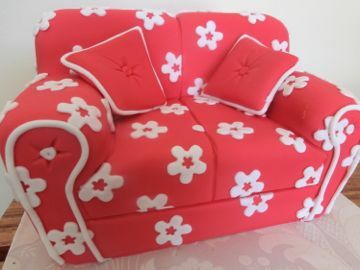 This is more reflective of my state of mind when it comes to cakes at the moment I think - i.e. I'm generally trying to avoid them - delivering them on a weekend is far to difficult when there are four of us wanting to do different things - the restriction of an absolute wedding cake delivery time is a real pain. 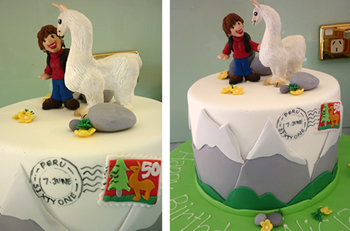 It's been a while between posts I know - but hopefully this Llama cake for a keen mountain hiker will smooth thing over between us.. I must declare that I didn't do the figurines as the cake was a co-production between me and a guy from work for our boss - he did the figurines. 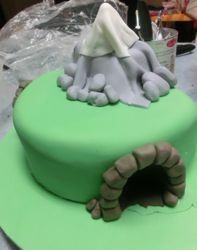 It's been a busy cake week this week and it's not finished yet.. This particular one is for the Antartic Division's midwinter dinner - Apparently it's a traditional celebration they have in mid winter at the Antartic bases - they sing, perform skits and generally celebrate passing the halfway mark of winter. 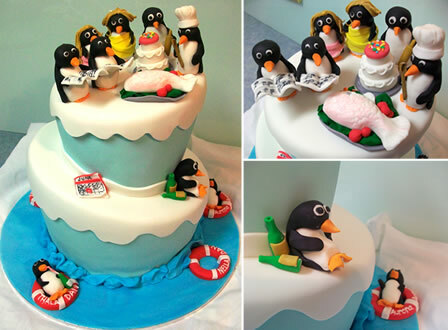 In the older times they also used to dress up as women as there weren't any on the base (hence the penguins in drag). Unfortunately I won't be required to deliver it to Mawson, Davis or Casey as they have a dinner in Hobart for all the returned people too. The client let me have free reign with the design so I hope she's pleased - I certainly spent much longer on it than she is paying for as it was quite a lot of fun! 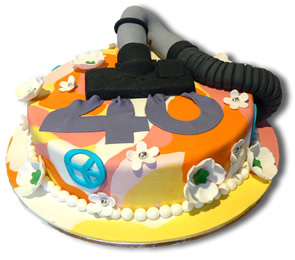 Hmmm... what to make for a sister obsessed with vacuum cleaning who is turning 40 and having a surprise 60s party.... this of course! 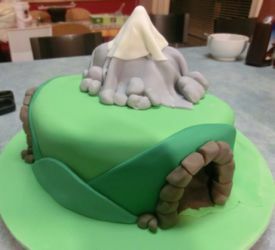 Normally when I have a cake theme I do a quick google image search to see what other people have done and what works and doesn't work. This week the world let me down but at least with this post, the next person who looks for a hippy vacuum cleaner cake might find this! 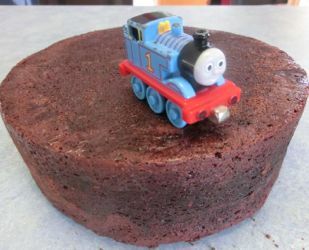 Surprisingly the only vacuum cleaner cake I could find on the entire world-wide-information-superweb-highway-thingy was an american bakery style cream cake with a picture of a dyson stuck on which wasn't even worth linking to. I must mention that Clare helped me with cake (both conceptually and physically), and on the night we all looked great - you can't see our funky trousers or my purple boots in this photo but trust me.. we sizzled . 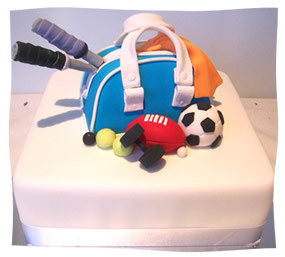 I've always wanted to do a bag cake, and with this sports themed birthday cake I got my opportunity! It's cooler in real life cos you can see the faux stitching and everything! btw: still no sign of holiday yet. 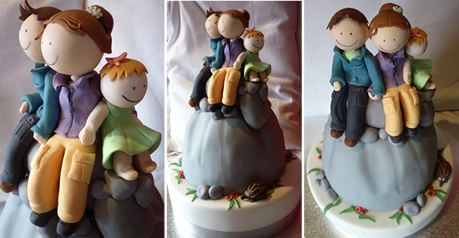 This is the last of the 6 cakes and one set of figurines I've made in the last fortnight. It's probably my favourite too - you can't beat fresh flowers I recon. Delivery was exciting - Denny and I had to brave bushfires and steep windy roads to deliver it to the Hartz View Winery in the Huon. The last bit of the road was lined with those apple pickers sheds you can see in the background. Here are the two cakes I had to finish on the night we moved. I was really glad that Denny came around to help me finish them so I got to bed before 1am on what was a VERY big day. 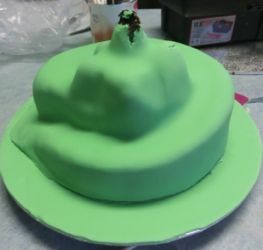 The design of the Robin cake was quite tricky actually - I had to work out the distinguishing features of Batman's sidekick as he only has the R as his logo which wasn't really going to be very exciting for Sam, the Robin fan. 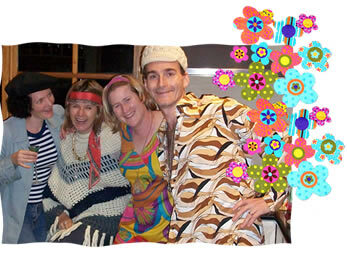 I was pretty happy with the Carlton scarf too - do you like the tassles? Getting an early start to the day.. This post will say Friday - but actually Friday hasn't really happened yet, although we are a good hour in. 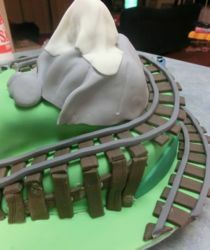 As usual I'm up a bit past my ideal bed-time - and as usual it's because I've been working on cakes - one for the weekend and this one for my work's 'First Week of Production' Party happening tomorrow night. 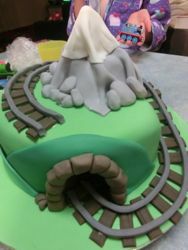 It's a voluntary thing but my enthusiam for making it was given a boost yesterday when I got a payrise!! I've never had an out-of-the-blue-you're-doing-well-so-we've-given-you-a-payrise moment in all my past positions (I like to think that is more because of the nature of the companies I have worked for rather than my abilities!) so it was pretty cool. My pay rise lifts me from 'paultry' to 'meagre' but I'm not complaining as they certainly could have gotten away without doing it, so it was a really nice gesture - yay. In other news, the creche has confirmed my suspicions that Jett may have been switched at the hospital. They have declared him a compulsive packer-upperer which is something I have witnessed here at home and is not is certianly not in my gene pool - although to be fair jon is quite tidy when left to his own devices. The other day we gave Zali some new shoes in a box (I didn't give any to Jett as he is VERY particular about his shoes and currently attached to his blundstones) - and after she had unpacked them and scattered the shoes and packaging around, Jett collected up the shoes, put them back in the box, put the lid on, THEN put them back in the plastic bag they came in! Then he dragged the whole bag away presumably to find somewhere tidy to put it all. Also when he blows his nose on a tissue, he is very particular about throwing the tissue in the bin afterwards. The creche said that he is normally the only toddler in his room doing any packing up and he is quite frankly a bit obsessive about it. It will be interesting to see how his environment influences his natural instincts.